Home »Racism»TSA: Transportation Security Administration or Turban Search Authority? TSA: Transportation Security Administration or Turban Search Authority? 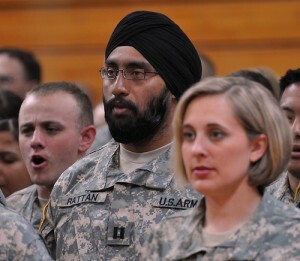 Capt (Dr) Tejdeep Singh Rattan (pictured) is a Sikh-American US army officer. But according to a new policy of the US Transportation Security Administration (TSA), when he or his family members board a flight in the United States, from now on they will be subjected to a mandatory turban search, culturally akin to stripping them naked. While Sikhs already have to pat their own turbans and have their hands swabbed by a screener, the new policy now requires them to go through an additional hand wand of the turban 100 percent of the time. With a policy specifically targetting Sikh-Americans, the agency may as well change its name to Turban Search Authority. Sikh-Americans are often mistakenly associated with the perpetrators of the 9-11 attacks, simply because Osama Bin Laden is pictured wearing a similar headdress. This has led to widespread acts of discrimination against Sikh Americans and a litany of problems at airports. Sikhs are required by their religion to wear a turban, the most visible marker of the faith. The turban symbolizes spirituality, gender equality and honor, and Sikhs consider its removal to be a grievous insult. The TSA holds that a turban could hide non-metallic objects. Whether or not there is truth to that claim, airport officials do not demand that priests or nuns take off their clothing in case they are hiding non-metallic objects inside. Hypocrisy and a fear of difference makes up the crux of this new discriminatory policy. The new policy has drawn widespread criticism. While in India, an Indian minister told President Obama that the United States must stop frisking the turbans of Sikh passengers. “It is a humiliating experience. For us it’s like telling us to remove our clothes,” said parliamentarian Harsimrat Kaur Badal. Obama replied that he would look closely into the matter but refused to make any commitment. To gain back some semblance of credibility, the TSA must address concerns from passengers with special religious or cultural dress needs. Tell the TSA that doing nothing in response to the outcry over its discriminatory practices is simply unacceptable.